Sign up and log onto SDKBOX.com. Integrate service plugins with your app automatically with the installer, or manually by downloading the bundles. 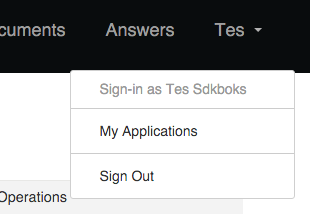 Click on your login name -> select "My Application" -> create a New application for your app with name and bundle info. 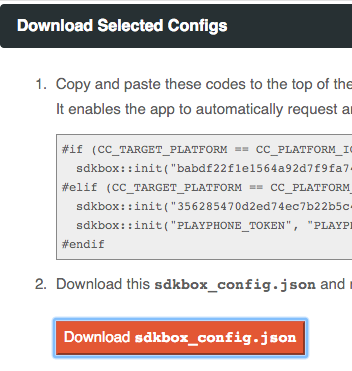 Upload the sdkbox_config.json from your app with "Import" function. One configuration set will be created for each app store. Select "Export" and follow the instructions to link up your app client with the LiveOps services. The newly created configuration sets are still in Draft state. They are not accessible by the client, until you can edit and publish them to the cloud. Learn more about Remote Config. Build Date UTC :2019-04-24 14:26:10.460907, Documentation built with MkDocs.